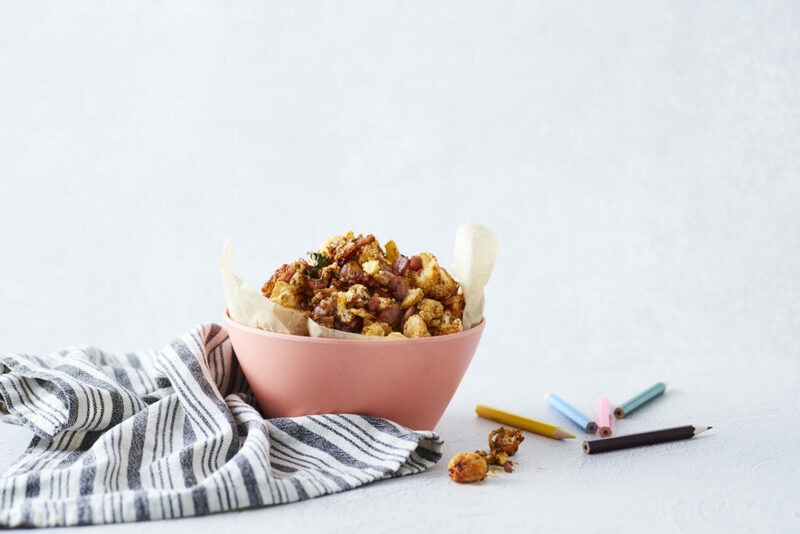 We guarantee the kiddies are going to love this little treat – yet another genius way to get a little extra veg into their tums. This one’s totally good for adults too, great as nibbles at your next dinner party! 1 large cauliflower, cut into bite-sized florets. 150 g bacon, rind removed, diced. 1. Preheat the oven to 200ºC/400ºF/Gas Mark 6 and line a tray with baking paper. 2. In a large bowl, combine oil, paprika, thyme and salt. Toss in the cauli pieces and coat well. Place on the lined baking tray and bake for 20 minutes. 3. Remove tray from the oven, sprinkle over bacon pieces and place back into the oven for 10 minutes, or until bacon is crispy. You can even switch the oven setting to grill to really crisp it up, just be sure to watch that the cauliflower doesn’t burn. 4. Remove from the oven and allow to cool a little before sharing between the kids!